Kathy and Carrie worked together creating the Bathroom Makeover. Laminated cotton was used for the shower cap eliminating the super thin vinyl and taking a step out of the shower cap construction. The laminated cotton selected is Erin McMorris Weekends Dots and Loops Peach. 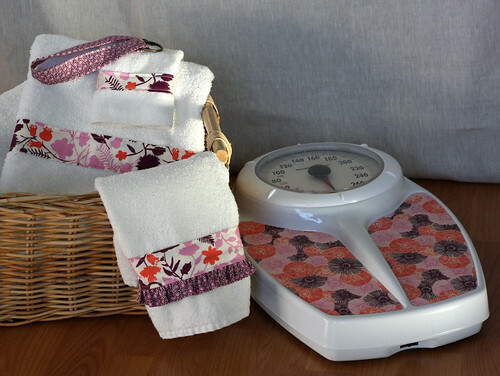 The scale, tiebacks and towel fabrics are Liz Scott Sugar Pop Painted Flowers Cream Pink and Dots Dot Dot Dot Eggplant. Kathy made the shower cap. She discovered a misprint in the book for the Measure, Mark, and Cut (pg. 41) step. She contacted designer June Scroggin who responded immediately to her inquiry (thank you June!). The correct diameter of the circle for the shower cap is 24″ not 30″. When covering the scale Kathy found fusing the interfacing to the fabric before cutting out the shape allowed her to skip using FrayCheck in step 3. Carrie did the curtain tiebacks and the towels. She found the directions to be straight forward and easy to follow. 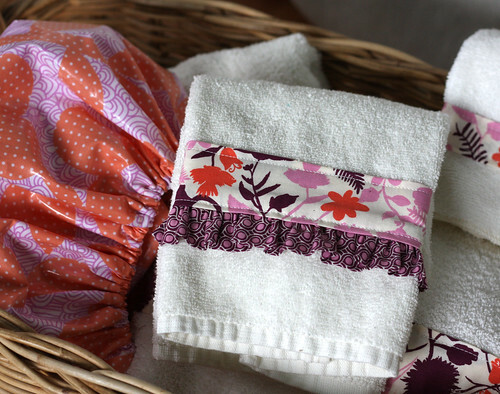 For fun she added a ruffle to the hand towel. Carrie plans to make a stack of hand towels for her guest bath. A perfect opportunity to bring in color and charm. Tracy selected Valori Wells Jenaveve Linen Floral Birds Garden Fresh. Tracy made her own bias tape using Valori Wells Jenaveve Linen Pebbles Teal. It required an extra 3/4 yard of fabric to create 10 yards of bias binding. Tracy found this to be a really fun and very practical project. 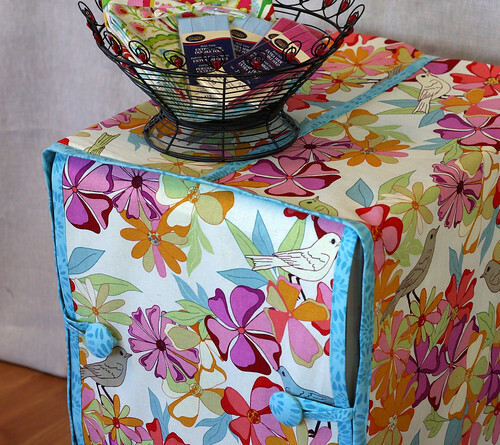 She plans to use variations of the pattern on several sets of plastic drawers. It is amazing that it only takes one yard of home dec fabric even when it’s directional like this one. The texture and drape of the linen is lovely for this project. The project calls for 1/2″ double-fold bias tape for the binding, purchased or self-made. Tracy made her own coordinating bias binding using 3/4 yard of linen. Cut two 25.5 inch trued squares. From the squares, cut strips on the bias. For a bolder trim, Tracy cut 2.5″ wide strips. She was able to cut long enough strips from the center of the squares so that the front pieces didn’t require seams. For the button loops, Tracy wanted them narrower and cut the 8″ strips 1.75″ wide. She covered the buttons in the trim fabric, a beautiful contrast! Tracy applied the binding to the bottom of each section then used separate pieces for each side. If she did this project again she would skip cutting the binding strips on the bias. There are no curves in the project so straight-of-grain binding would work just fine and save fabric. Tracy’s file cabinet was very tired looking and at least 25 years old. She’s excited that it can now be displayed in open view! The entire Pink Chalk Team loves Tracy’s end result. 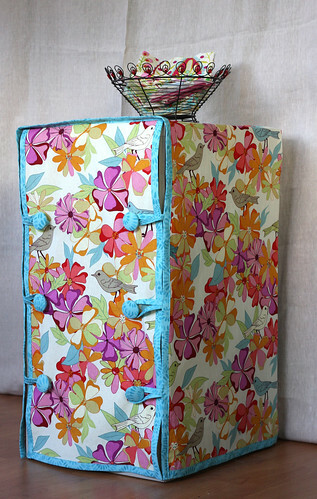 We’re all inspired to beautify our own file cabinets.